Former Chairman of the House Oversight Committee, Jason Chaffetz said on Thursday that Rep. Adam Schiff must lose his security clearance. The former Utah lawmaker reacted to the political fallout from Attorney General Bill Barr’s summary of Mueller’s “principal conclusions” on the Russia investigation in an interview on Fox Business Thursday. “I think what [Rep. Schiff] should do is lose his security clearance– without a security clearance he can’t serve on the committee. To lose the trust, albeit on the other side of the aisle, I have never seen,” he said during an interview with “Trish Regan Primetime” Thursday. The Democrat-media complex was stunned when Attorney General Bill Barr revealed that Mueller concluded his investigation and found no evidence that Trump’s camp colluded with the Russians during the 2016 presidential election. House Intel Chairman Adam Schiff (D-CA), however, continues to spread the BIG LIE that Trump colluded with the Russians despite never actually providing evidence to back up his outrageous claims. 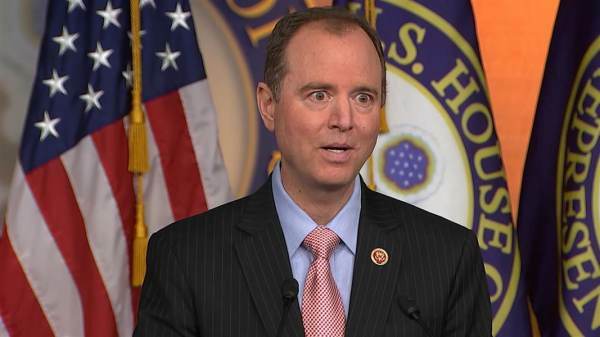 In fact, shameless liar Adam Schiff told ABC’s George Stephanopoulos Sunday that there is “significant and incriminating evidence” that Trump colluded with Russia during the 2016 election even though Mueller concluded his investigation with no new indictments. Schiff is also a serial leaker and reportedly leaked portions of Donald Trump Jr.’s closed-door testimony to CNN — a stunning ethics violation. President Trump was so furious with “pencil neck” Adam Schiff that he called on the California lawmaker to resign from Congress altogether after members of the House Intel Panel signed a letter to remove Schiff from the Committee.